What does this Trust Quote teaches us? 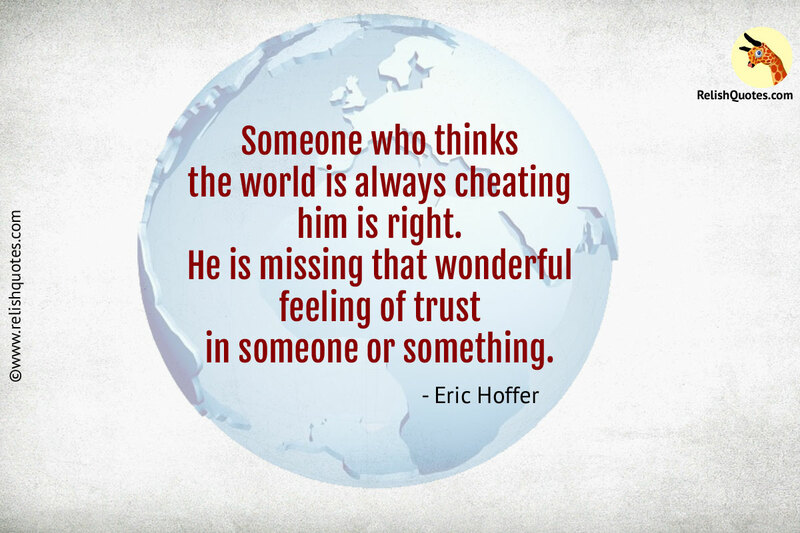 Cynical headed people are in plenty in the society and it is Trust Quote like these that work like stamps on fact, that there is no end to goodness on planet Earth. This Trust Quote lays emphasis and aid us in having the right outlook towards life. There is absolutely no doubt in the fact that relying and placing trust on someone is a task that should be done, after thinking twice. Today, people around us live for utilising and exploiting the positive aspects of a person in front of them, and in the process of being ruthless and taking advantage of the other person, develop a tendency to stop trusting people. Every person is on the outlook, of using the other person and there is no way out in such a scenario, but to lose trust on the emotion itself. But on the other hand, the same person also lives in the “Ignorance is bliss” zone. If you just cease to trust the world, there is one important feeling and experience that you definitely miss out on the journey of life, and that is, you can never experience the joy, ease and comfort in confiding in someone, knowing that you have a support to hold onto when the turbulences of life hit you, someone to catch you when you fall. Not everyone on planet earth is bad or harsh. It is time that cynics and pessimists undergo a radical and much called for transformation in the thought processing. If you have a set and pre-determined opinion, it is good as everyone is entitled to have their own opinion. But a mild change in your outlook can take you miles ahead in life. So stick by your opinions, but in the process, do not forget to appreciate and value the sheer calm and relief, that you experience in trusting someone with your heart and soul.